Two stories that have been cementing their status as the leading domestic and foreign policy concerns facing the country were at the top of the news agenda last week, according to the Pew Research Center’s Project for Excellence in Journalism. For the fifth consecutive week, the debate over health care proved to be the No. 1 story in PEJ’s News Coverage Index, filling 28% of the newshole from August 17-23. The health care debate also continued to overshadow the economic crisis as the top domestic story. The war in Afghanistan—which has eclipsed Iraq as the main focus of international attention—was the No. 3 story at 10%, exceeding its record level of the previous week and generating its highest amount of coverage since the PEJ began the News Coverage Index in January 2007. While last week’s health care skirmishing generated almost as much attention as it had the week before (when it was 32%), the narrative shifted markedly. If “death panels” and town hall eruptions fueled the storyline a week earlier (Aug. 10-16), the term “public option” and a growing consensus that the White House was losing the political/message battle permeated coverage last week. Indeed, Barack Obama and his fellow Democrats not only faced criticism from conservative sources; they also endured friendlier fire from liberal commentators like comedian Bill Maher and MSNBC host Keith Olbermann. As has been the pattern in recent weeks, coverage of the health care battle was most extensive on cable (51% of the airtime studied) and radio (39%)—the two media sectors featuring ideological talk shows. But after several weeks of coverage driven by the town hall confrontations, the storyline shifted last week. Attention to the protests themselves waned, and media and commentators focused on a political scorecard for the key players. In much of that calculus, Obama came out on the short end. One major event triggering the analysis was an apparent administration retreat on the need for a “public option” that included a bigger role for government. The administration’s scramble to clarify its stance on the public option was the subject of this report on Campbell Brown’s August 18 CNN program. With the August 20 elections as the backdrop, the deepening conflict in Afghanistan continued its emergence in the media last week. Filling 10% of the newshole studied from August 17-23, the topic nearly doubled the previous week’s coverage (6%), which had been the high water mark to date. It was the top story in the online sector (20%). In the past three weeks, Afghanistan has filled 6% of the newshole, trailing only health care and the economy in the competition for coverage. That represents almost three times more attention than Iraq received in that period, a growing sign the press now perceives the conflict as Obama’s war as he winds down the U.S. role in the conflict George Bush launched. There are a number of factors behind the growing media interest. Obama has made Afghanistan a strategic priority, linked it to the instability in Pakistan in the so-called “Af-Pak” paradigm and increased the number of troops amid increasingly dire warnings about the resurgence of the Taliban. The casualty count has grown as the fighting has escalated and last week, the country’s national elections were conducted under attacks, threats and intimidation. How much one knew about the country depended enormously on where one went for news. 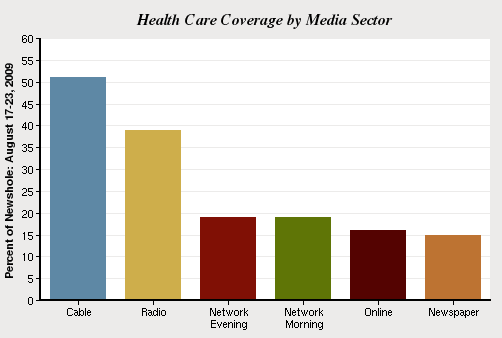 One element of the expanding coverage, indeed, has been the attention to the story by National Public Radio’s Morning Edition, one of the programs studied in the News Coverage Index. Since the beginning of August, Afghanistan has been the top story on the program, filling 22% of the airtime studied. The same was true for the week of August 17-23, when Afghanistan accounted for 21% of the Morning Edition newshole. On August 19, one day before the balloting, NPR’s Renee Montagne, who had spent a month in Afghanistan, described how major advances in media and technology had increased interest in the election. After the election, however, much of the media narrative focused on problems and controversies connected to the vote. At 10% of the newshole, the economic crisis was the No. 2 topic, barely edging out Afghanistan. But this also marked the third straight weekly decline in coverage. With most indicators showing the recession leveling off but pointing to a slow recovery, the story, from the press perspective, appears less dynamic and urgent than the partisan skirmishing over a health care bill that may come to a head next month. As is typically the case, that topic still led the newspaper sector last week, filling 19% of the front-page coverage studied. And two major storylines—unemployment and the housing market—led the coverage. On the employment front, the media picked up on a worrisome jump in jobless claims. The news was better in the real estate sector, where a 7% rise in housing sales in July exceeded expectations. The fourth-biggest story, at 4% of the newshole, was the controversy surrounding Scotland’s decision to release terminally ill Abdel Basset Ali al-Megrahi, the man convicted of the Lockerbie airline bombing. With al-Megrahi receiving what was widely termed a “hero’s welcome” in Libya, his release triggered plenty of protests, including one from the White House. The No. 5 story (also at 4%), involved the U.S. effort against terrorism. One of the key storylines last week was the news that former Homeland Security Secretary Tom Ridge claims in a new book he was pressured to raise the terror alert by administration officials right before the 2004 election. In joining the ranks of such ex-Bush administration staffers as Scott McClellan and Treasury Secretary Paul O’Neill—who offered critical assessments in books—Ridge triggered a pretty lively debate, much of it on cable, about motives and veracity. As the focal point of the health care coverage last week, much of it negative, President Obama dominated the competition for exposure. He was the lead newsmaker in 10% of the week’s stories. 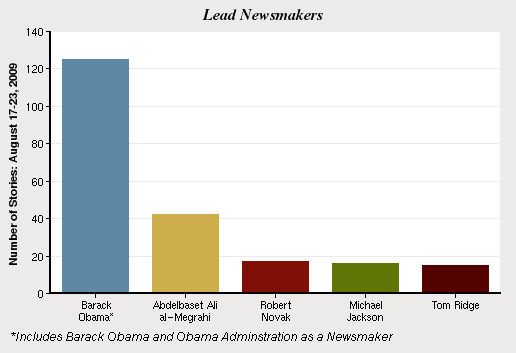 (A lead newsmaker is featured in at least 50% of a story.) Next, far down in numbers, at 3% of the stories, was the freed Lockerbie bomber Abdel Basset Ali al-Megrahi. The third-biggest newsmaker (1%) was Robert Novak, the conservative columnist and curmudgeonly cable personality who became best known late in his career for the column revealing the identity of CIA operative Valerie Plame. He died last week at age 78. The No. 4 newsmaker, (1%) was Michael Jackson, who last week was the focus of coverage speculating about when the late pop star would be buried. The fifth-biggest newsmaker, 1%, was Tom Ridge, the newly minted author and Bush administration critic.